Who shot at the Chattri memorial? 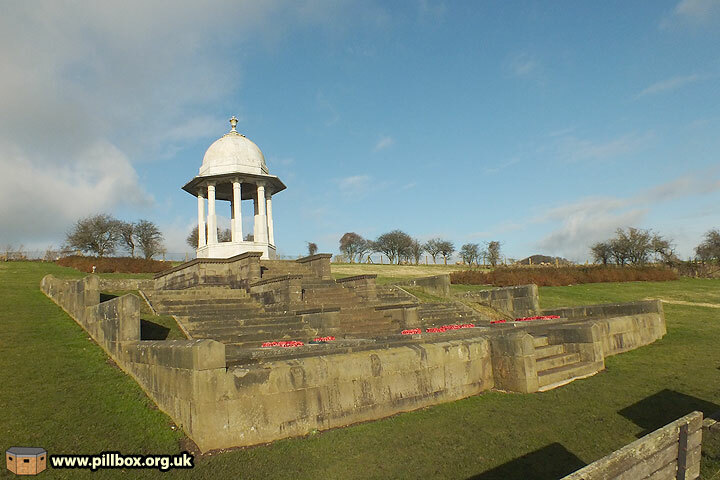 The Chattri is an unusual war memorial. 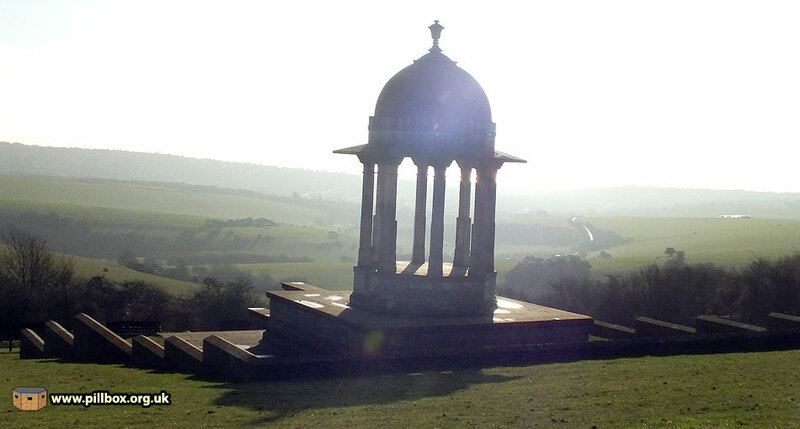 Situated on the South Downs, it commemorates Indian soldiers who died in Brighton during WW1 and were cremated at this isolated spot. During WW2 the memorial suffered some damage. Who was responsible for this damage? 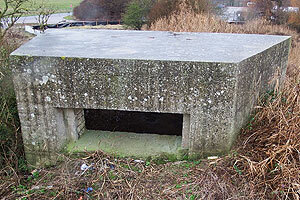 The monument lies within an area that was requisitioned for training and the supposition has seemingly been that troops used it for target practice whilst on exercise. Some analysis provides an alternative explanation. Indian soldiers wounded in France and evacuated to England were treated in hospitals in Brighton, including the famous Royal Pavilion. 53 of those who died of their wounds were Sikhs and Hindus. 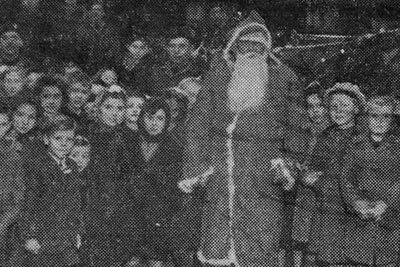 They were cremated on the downs near Patcham, Brighton, their ashes being scattered in the sea as part of their religious rites. 19 Muslim soldiers were buried near a mosque in Woking, Surrey. In the 1920's, a memorial was erected at the cremation site; the influence of Indian architecture is evident in the photo below. A recently retired Indian Army officer who visited the memorial in armistice week 1945 wrote to Field Marshal Lord Birdwood that it was "in a throughly dilapidated condition and has apparently been used as a target by troops during training as the memorial is now cracked and pitted by rifle bullets." Birdwood passed this on to the India Office and when the land was derequisitioned in 1946 the War Office accepted the charge for repairs and agreed to restore the Chattri to its original condition. And this is where my investigation began; having visited the Chattri for the first time, I noticed the pock-marks and instantly recognised them as potential war damage, based on my experience of damaged gravestones in Eastbourne's Ocklynge Cemetery and Hove Cemetery. Not having known about the damage beforehand, I went home and searched online, finding the above website and the theory that exercising troops had caused the damage. Your first visit to the Chattri impresses upon you just how isolated it is. The monument sits on a sloping hillside overlooking a valley and is just over a mile from the nearest public road. You can see the monument long before you reach it, and this makes it seem all the more remote. The journey back to the road with the Chattri behind you always feels shorter. According to the interpretation board at the site, "Chattri" means "umbrella" in Hindi, Punjabi and Urdu and this is reflected in the focal point of the monument, which is a marble dome supported by eight pillars. A stone staircase leads from the foot of the monument, which incorporates three granite slabs that mark the original cremation sites. 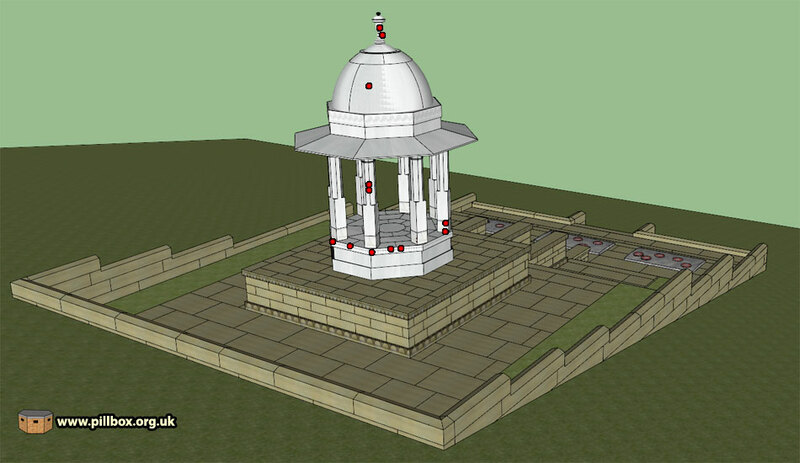 The architecture, location and story behind the Chattri is fascinating and so after a couple of visits I decided to build a 3D model of it as part of my research. The graphic below gives you an overall impression of the monument. The site is within a fenced compound to keep sheep and cattle out. 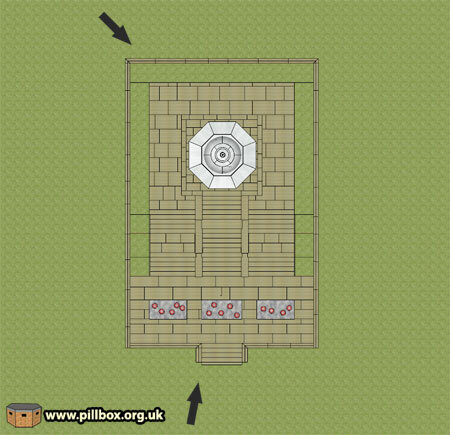 Paths and flowerbeds are laid out with the Chattri in the centre of the site. In 2010, a new memorial wall (photo at right) bearing the names of the 53 soldiers cremated here was unveiled. 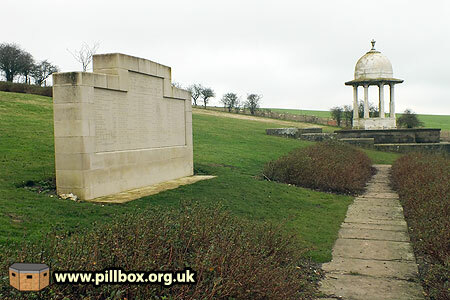 http://www.cwgc.org/find-a-cemetery/cemetery/5001087/PATCHAM DOWN INDIAN FORCES CREMATION MEMORIAL. Accessing these records, it is interesting to note that the first casualty to be cremated here died on 31st December 1914 and the last on 30th December 1915 - exactly one year apart. The photo at right shows the first indication I had that the Chattri had been damaged. 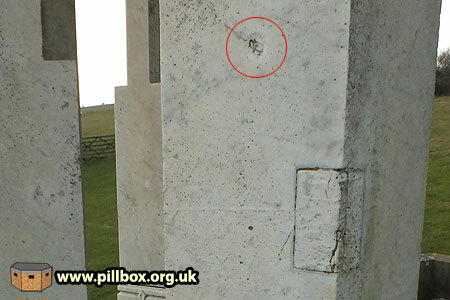 One of the eight pillars supporting the dome has been repaired by the insertion of a rectangular block, a technique I've previously reported on in both Ocklynge and Hove Cemeteries to patch up bomb-damaged gravestones. There also appeared to be a bullet strike (ringed) close by that added to my suspicion and suddenly I was seeing damage everywhere. 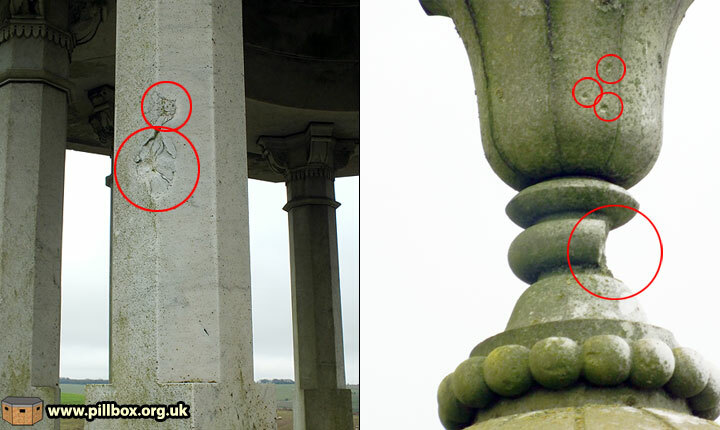 Looking down, I saw that the marble plinth upon which the pillars and dome stand was pitted and cracked as seen in the photo below. 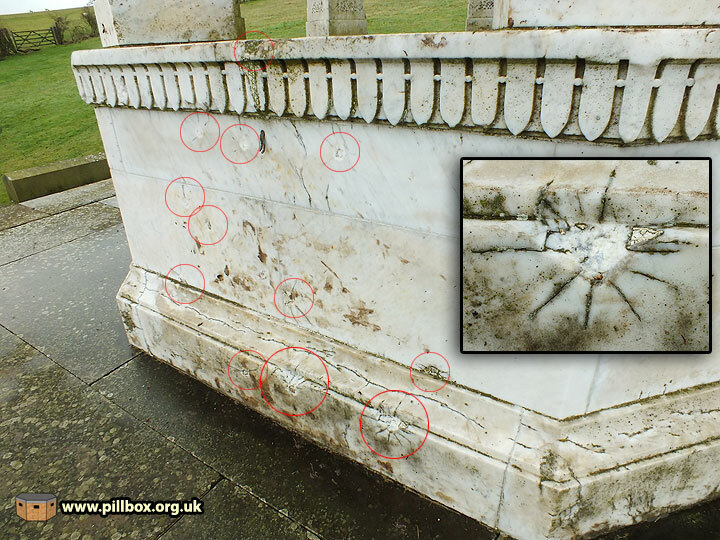 The inset in the photo is a close-up of a pock-mark; the radial cracking is very reminiscent of gravestone damage caused by bomb splinters. Evidence of some sort of repair in the form of filling material is visible on the right. Moving down the monument, the steps have also taken a hammering. 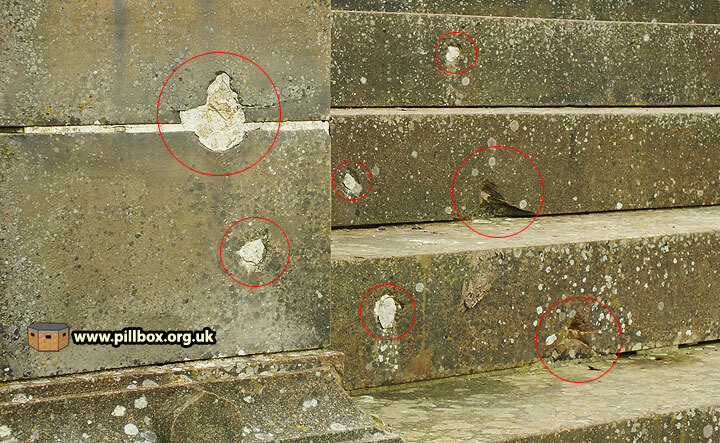 (Photo below) It appears that all damage was filled and patched with mortar, some of which has since fallen out. Spots of lichen growth can be easily mistaken for patched holes, but close inspection eliminated these. The front wall of the monument has also been heavily hit; it took two visits to actually realise that there were five impacts here; the lower two only became apparent by the sun casting shadow in them. We'll come back to this group a bit later. Looking back up at the Chattri's dome, I noticed some probable strikes on it as shown in the photo below; there will undoubtedly be more damage on the higher parts that is difficult to identify to see from ground level. 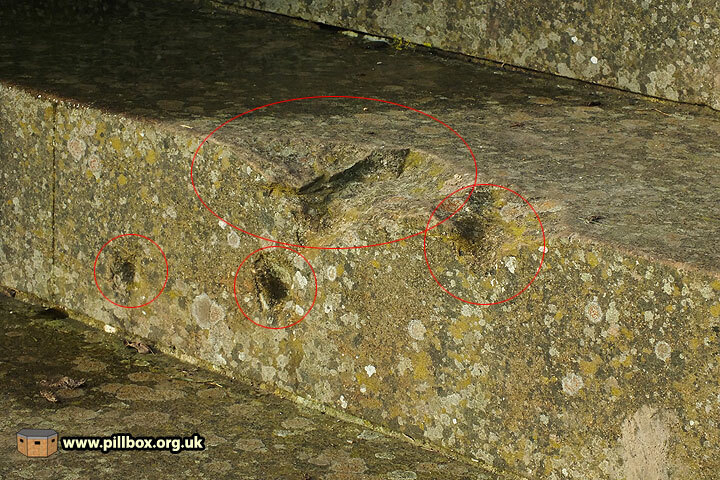 It took a couple of hours to try and plot the damage; the strikes on the stone steps are located by measurement. The reason for this will become apparent later. I've marked the strikes on the graphic below; the scale means that some of the red spots actually represent two or three hits; there's about 90 represented. Does this actually tell us anything? 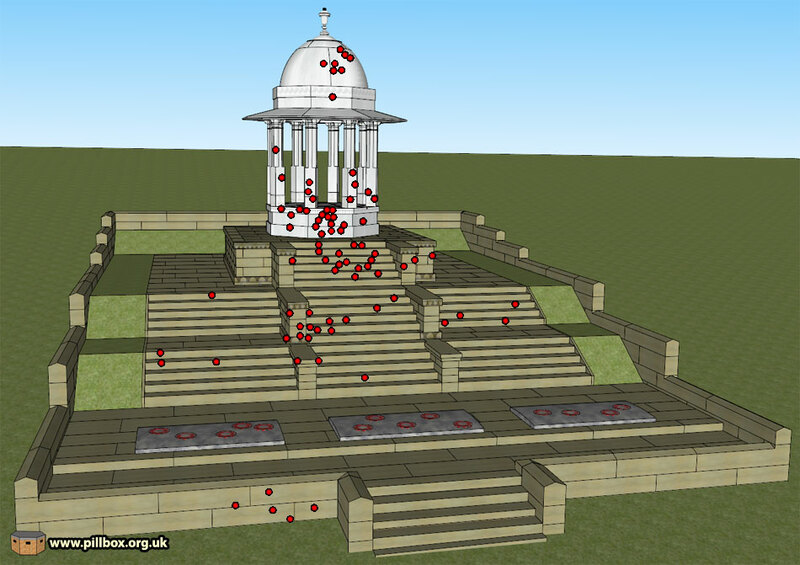 As it stands, it does perhaps indicate that whoever was shooting at the monument was aiming at the centre; note how most hits are on the central staircase and the marble structure itself, but are we dealing with one single machine-gunning incident or 90 separate incidents of rifle fire? The graphic below shows the damage to the NW side. Here the damage is much lighter; I could only identify about 15 bullet strikes here, although again, there may be many more on the dome that cannot be seen from the ground. The growth of lichen on this side of the dome is quite extensive and probably masks more damage. 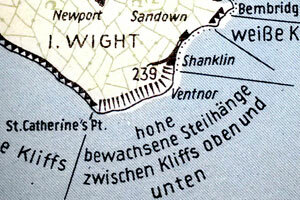 In 1941, the Army made moves towards requisitioning vast tracts of downland for training of all sorts, from artillery practice to tank manoeuvers. 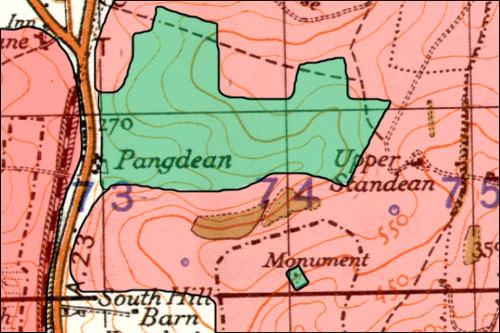 The Chattri stands at the western edge of Block 4 of the training area and the wartime military map is clearly marked 'monument' and within the boundary fence. A Ministry of Agriculture map also marks the Chattri as an 'island' i.e. an area that was out of bounds to troops in order to protect it from damage. I've shaded the map at right; red indicates the battle training area and green the islands. The army viewed such islands as a problem, as they effectively ruled out large-scale training in the vicinity to avoid encroaching upon them. Another problem was that Central Electricity Board high tension overhead cables passed through some areas. One set of pylons was about 800m south of the Chattri. A German Junkers 88 bomber crashed into these lines about 1.5 miles from the Chattri in 1942 and in December 1943, a 4.2-inch mortar round caused considerable damage to some cables further west at Fulking. I don't expect an 'out of bounds' sign and fence to have been the ultimate deterrent to the average soldier and more than one war diary records all sorts of willful damage to property being perpetrated by British and Canadian soldiers. Murder, looting, brawling and theft are all crimes committed in Sussex by Allied troops, so shooting at a monument is not out of the question. I should also point out that these Standing Orders are dated November 1943 and are the only ones I've found so far. It's therefore possible that the above quote was included in the orders in response to the Chattri being damaged. If we briefly move two miles from the Chattri to Stanmer, a document of November 1942 (one year earlier) states that Stanmer Church was undamaged, but this was not the case by the end of the war. The photo at right shows what local legend says are a pair of bullet holes in the clock. The village had been evacuated and the Canadians had taken it over to use for street fighting exercises. The interior of Stanmer House was described as "very dirty" and windows had been broken. Of the dozen cottages in the village, one had been gutted by fire and two others had been extensively damaged, with collapsed ceilings and leaking roofs. The doors had been left open and swinging in the wind by the previous occupying unit. The author of this report, a Lieutenant-Colonel, stated that "I formed the opinion much of the damage done was the result of wanton destruction by troops." 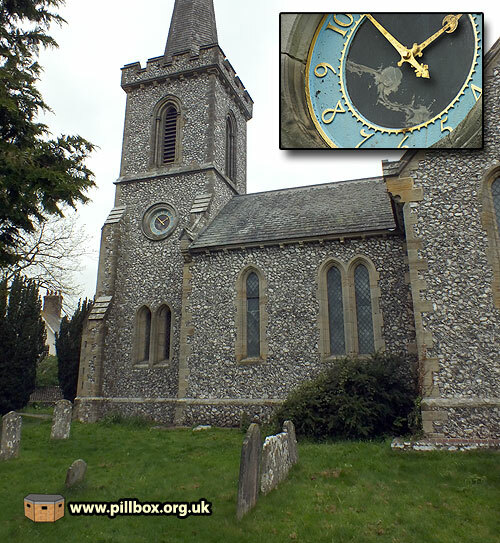 If the damage to the church clock was caused by bullets, then it wouldn't surprise me in the least. This may even give us an insight into the mind of the average soldier for whom the temptation to shoot at a 'target' might have been too great to resist. As far as possible exercises will be designed so that shooting will naturally be directed from the boundaries of the areas towards the centre and along the length of the areas. Targets will be erected in valleys and hollows as far as possible, so that fire will be directed against the sides of slopes and ridges. If targets are not used, the importance of shooting only into the sides of ridges will be impressed on all ranks. There must be a responsible Officer or Senior NCO with every troop of tanks, infantry section, mortar detachment, carrier section and equivalent sub-units. These Officers or NCOs will have the dual role of checking faults as they occur and ensuring that reasonable safety precautions are observed. 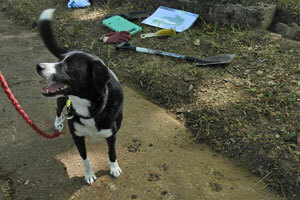 They must also carry out a preliminary recce of the ground before the exercise takes place. The reason I measured the locations of the strikes on the steps was to try and establish whether or not troops could physically cause this damage. A few strikes illustrate the point in the graphic below. This shows the lowest possible trajectory of a bullet striking one particular step, but without hitting the edge of the step below. This indicates that a rifle being fired from the bottom of the steps would need to be at least 6ft off the ground to make the shot possible. The shot illustrated above is possible for a tall soldier, but would he be likely to shoot from there, and at that particular step? Every soldier knows that shooting at a hard, vertical face will risk the bullet ricocheting straight back with potentially fatal consequences, especially at point blank range as illustrated here. Even shooting at an angle, the walls flanking the steps might trap the round with unpredictable consequences. The ground slopes away down hill, making the shot less likely the further away you move. Also, why shoot 100 rounds randomly at the steps and dome? It would seem more feasible for bored soldiers to actually fire for effect, ie, why not shoot with the intent of knocking the finial vase off the top of the dome in the same way that shooting the Stanmer clock cracked the face? (The finial damage does not appear to have come from downhill.) The aforementioned safety Officers/NCOs would quickly stamp out any random firing. But what weapons caused this damage? Let's return to the front wall damage as seen at right. The lowest pock-mark is smaller than the others, leading us to reasonably assume that two different calibres of projectile hit this area. The small mark is 2cm, while the larger ones are 5.5cm. I'm by no means an expert, but larger holes must indicate larger calibre in the same material. Troops likely to have been here would have had .303" ammunition for their rifles and machine-guns. 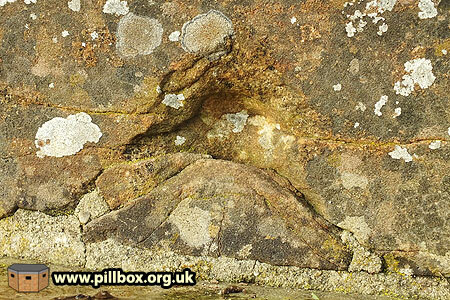 Now look at the pock-mark shown at right; it's 5cm across and has carved out part of the surrounding stonework. 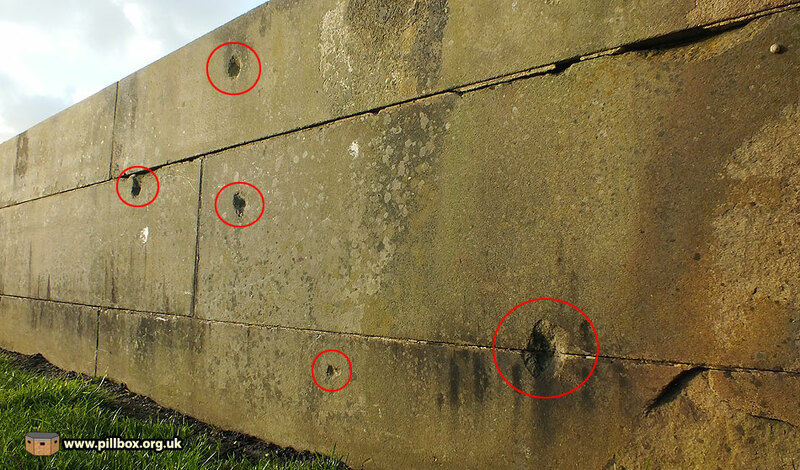 I'm just not convinced that a rifle round could cause damage like this, considering that several much smaller pock-marks can be found. 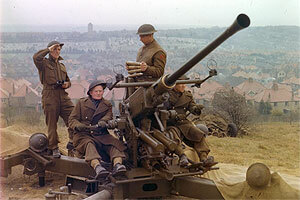 Firing with all types of live ammunition is permitted within the areas, except with: 25-pounder solid shot, 17-pounder, 6-pounder, 2-pounder, 40mm, .55 anti-tank, 15mm BESA. So Allied weaponry capable of making the larger marks were prohibited on this training area. When you also throw in the supervision of live-firing exercises, the seemingly random spread of the damage and the fact that line-of-sight would make some of the shots almost impossible for somebody standing even only a short distance down the slope, it seems increasingly unlikely that the damage was caused by Allied troops on the ground. My theory is that the Chattri was strafed by a low-flying German aircraft. I have no documentary evidence for this, only what the landscape is seemingly telling me. Firstly, the mixture of large and small pock-marks; the German Messerschmitt Me 109 was armed with both 7.92mm machine-guns and 20mm cannon which can explain the two pock-mark sizes on the front wall. Secondly, a low-flying aircraft can fire directly at the Chattri from a height that makes the theoretical trajectories possible. Thirdly, the spread of shot across the steps may be explained by the fighter having both engine-mounted and wing-mounted guns. I don't know the distance between the wing guns on the Me109, but it might fit the spacing between the strikes on the outer staircases. However, with an aircraft moving at 350-400mph and possibly side-slipping as it fires, it's impossible to reach any firm conclusion. What about the damage on the NW side? This also seems to have a mixture of small and large strikes, which perhaps indicates that the aircraft turned around and came back for another attack. This is pure speculation, but the lighter damage on this side may be due to the higher ground level at the rear, giving the pilot less time to open up without the danger of hitting the ground or the monument itself. The arrows on the graphic at right indicate the likely angles of attack. Of course, there's no way of telling which happened first, or even if they were related incidents on the same day. As the Chattri stands on a hillside at the end of a valley, it is quite possible that the aircraft might have attacked Brighton and flown up the valley, and, seeing the incongruous site of the Chattri standing out in white marble engaged it as a target of opportunity. The spread of strikes from the front wall, all the way up to the dome may be explained by the aircraft rising as it flies over, centering the aim up the steps. The remoteness of the Chattri means that such an attack could have happened without anyone being aware of the damage for some time. If nobody witnessed it, it's easy to see why Allied troops might be blamed, especially after all the damage caused at Stanmer. I may well be proved wrong if documents do come to light, but with the evidence I've gathered about the rules governing live-firing and what the landscape is saying, I really don't think that British or Canadian soldiers caused the damage to the Chattri. I also don't believe that the blame was deliberately placed on soldiers; the War Office paid for repairs and, given the reputation troops had for damaging property, I'm not surprised. However, this episode represents perhaps only a few minutes in the history of the Chattri - and it distracts attention from the real story, namely that the sacrifice of Indian soldiers is commemorated here. The observance of the religious rites of Sikh, Hindu and Muslim soldiers is something that astonished me when I heard about it for the first time some years ago. I had previously watched the film Ghandi in history lessons at school and had learned about the shameful Amritsar massacre of April 1919. But just under two years later the Chattri was unveiled, although proposals for its erection had been tabled as early as 1916. Having spent a few hours at the site, I had the pleasure of talking to a few visitors to the Chattri who were interested in what I was doing. Several of them stated how they come here to witness summer sunsets in quiet contemplation. 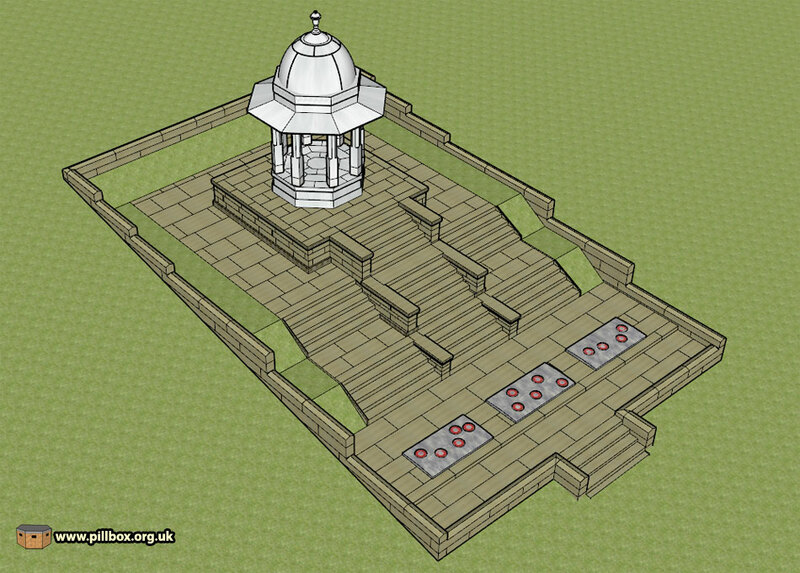 A memorial service is held here on the third Sunday in June by the Royal British Legion - more details and directions at http://www.chattri.com/index.php?The_Chattri_Memorial_Service. I for one, shall be attending this year's service.